TuraPur Pitcher Reviews - Is it a Scam or Legit? The TuraPur Pitcher and Countertop water systems claim to free hydrogen and increase the alkalinity, delivering antioxidants and other health benefits. The TuraPur Pitcher and Countertop water ionizing systems promise to deliver hydrogen-rich water with high levels of antioxidants. As a result, we’re told your water will taste and smell better, and may even help you experience increased energy, more radiant skin, and healthier joints. In fact, TuraPur mentions in several places on their website that these systems can “revitalize your cells from the inside out” and provide you with a “fountain of youth”! Once we step away from the sales pitch though, what can you realistically expect from drinking TuraPur water, whether from their Pitcher or Countertop system? Will you find it worth the price? Sit back, grab an ice-cold glass of water, and we’ll discuss what we learned during our research. Is There Any Benefit to Drinking Alkaline Water? However, the article goes on to mention that there are some studies showing alkaline water may be able to provide benefits in specific circumstances, such as reducing acid reflux. In some studies, it’s also been shown to provide benefits related to high blood pressure, high cholesterol, and diabetes. Does hydrogen water have more clinical evidence to support TuraPur’s claims? What About Hydrogen Water? Is It Proven to Provide Health Benefits? Compared to alkaline water, hydrogen water seems to have a meaningfully greater number of clinical studies behind it—although they might not necessarily support TuraPur’s claims. What do we mean? Back in 2007, Nature published a study that found rats who inhaled hydrogen gas reduced oxidative stress in their brains by a marked amount. While this referenced inhaled (versus oral) hydrogen, it seems to have set off a chain reaction, leading to dozens more studies in its wake. To see what we mean, you can quickly hop over to the National Institutes of Health’s PubMed and browse through nearly 50 different studies specifically looking at the potential benefits of drinking hydrogen infused water (here is one quick example). Like the original Nature study though, you’ll find that many were conducted on mice and were focused on very specific issues (e.g. metabolic syndrome, muscle degeneration, detrusor overactivity, etc.). This means 1) these benefits may not necessarily transfer to humans and 2) there seems to be limited clinical evidence that hydrogen (or alkaline) water can help you look younger, increase your energy, improve joint condition, or many of the other claims made by TuraPur’s manufacturer. Before moving on, let’s talk about one more thing: antioxidants. Will Antioxidants Provide Any of These Benefits? The term antioxidants describes a class of substances that inhibit oxidation. What’s this mean? In a nutshell, when oxidation occurs, molecules called free radicals are released, which may be a contributing factor toward serious conditions like narrowed blood vessels, cancer, and more. So, by inhibiting these free radical, antioxidants are thought to benefit our health. The issue is that medical science still doesn’t have a clear understanding of which antioxidants are best for you, whether or not they actually provide any benefits, and if they do, which amounts are needed to provide the desired effect. How does this relate to TuraPur’s filtration systems? While we didn’t test either the Pitcher or Countertop models, even if they really do create antioxidant-rich water, it seems the overall body of clinical evidence is limited that this will translate into any real-world benefits. How Much Does the TuraPur Pitcher Cost? 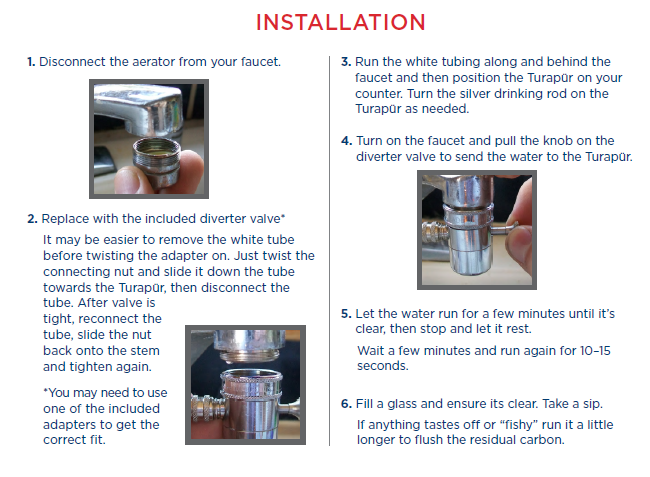 TuraPur’s Pitcher and Countertop models come with a 3-year warranty for free replacement of defective parts. Outside of this, however, no refunds are available. In order to process a warranty claim, you’ll need to contact customer service at (866)-706-5304 or customerservice@lfb.org. Given the price and available clinical evidence for TuraPur’s systems, are customers expressing satisfaction with their purchases? Are TuraPur’s Customers Leaving Positive Reviews? Are There Other Options? Outside of these, you can purchase whole bottles of pre-alkalined and hydrogenated water online (and even some big box retailers, like Walmart), as well as sticks and tablets that promise to accomplish much of the same. From a company perspective, TuraPur’s systems are manufactured by Laissez Faire’s Living Well, LLC, who also manufactures a line of nutritional supplements intended to support brain health, joint health, and more. The company is headed by Nate Rifkin, who specialized in direct response marketing and spent years as a copywriter before launching into the world of nutritional supplements and water filters. According to one of Nate’s long-form landing pages, he got into the industry after meeting a man who was 50, but who looked no older than 30. Nate claims the man revealed his “fountain of youth,” which ended up being some kind of briefcase-sized electrolysis machine that produced hydrogen-rich water. Nate sampled the water and was so convinced by its beneficial properties that he paid the man $4,000 for it, which he then used to create a less expensive machine that could accomplish much of the same. The result is the TuraPur Pitcher. Alright, we’ve talked a lot about the TuraPur Pitcher and Countertop systems, so let’s bring everything together to help you make a more informed purchase. Is a TuraPur Pitcher (or Countertop) System Right For You? Ask any doctor or health specialist, and they’re sure to tell you about all the potential health benefits related to drinking plenty of water, including calorie control, energized muscles, healthier-looking skin, improved kidney function, and more. On top of this, drinking alkaline water may help reduce symptoms related to acid reflux. On the other hand, based on the available clinical evidence and professional feedback (on NIH’s PubMed, as well as on other third-party online resources), it seems up in the air as to whether or not hydrogen-infused water will provide any real world benefits. The good news is that activated carbon filters (such as the ones used in TuraPur’s Pitcher) can certainly help your water taste and smell much better—just keep in mind that you can find hundreds of different activated charcoal pitchers online, as well as at nearby retailers. Often times, you’ll find that these options (as well as their replacement filters) are priced meaningfully lower than TuraPur’s Pitcher. Given this, is it worth spending the extra money on TuraPur’s systems? Ultimately, this is a question only you can answer once you’ve carefully weighed the evidence, as well as some of the pros and cons outlined here. Just remember that if you decide to roll the dice, no refunds are available if you’re dissatisfied. If you do purchase the TuraPur Pitcher or Countertop system, be sure to tell the world about your experience and write a review below! The water tastes great, but the pitcher leaks at both of the front two corners of the square-shaped vessel. I keep a microfiber on my counter just to place under any glass that I am filling with this pitcher. All I did was read through the propaganda for this product. I NEVER authorized any order at all. Nevertheless, an order was processed. As soon as I received this so-called confirmation, sent an immediate email disputing the order, and telling them NOT to send it. I called the next morning and basically said the same thing, along with some threats of reporting this company if they proceeded. They still charged me for it, and sent the product, despite my protestations! I called one more time today and spoke with a nasty supervisor, who would not stop talking long enough for me to explain just what happened. That is the new tactic in dealing with potential customers who have complaints...continue talking over them till we give up! I will not. I am disabled, and their answer was to send the package back, etc. etc. etc. You know the drill. There are no post offices nearby (have been eliminated) and it would be very difficult to get to one to mail back. So much simpler NOT to send it off from the start. When I told the vocal supervisor that I had contacted my credit card company, she refused to talk to me...despite the fact that my credit card company TOLD me to call and find out why it was even put through in the first place. Now I see all the very unhappy people on this site, and I understand why I got treated the way I did. My bank will take care of the charges, and they can duke it out with this no good and underhanded company. The review guidelines state the companies want to make things right. Don't think so...not when I'm lied to, not when they claim I NEVER called, etc. I don't call that making anything right; rather it's pointing the blame on us, and not the REAL problem. Now that I know who is behind this company, I'm sending my email to them, and to AGORA as well, before I contact the attorney general and the BBB and anyone else who oversees this company's practices. I hope they send my filter replacement refund. I'm sorry, but this isn't what I hoped for. I was hoping to get better tasting water, but I got water that was unsatisfactory. Please send me a return slip. The filters came today and cost me more than I expected. Please cancel any future orders. I am sending this untouched package back and ask that my money be refunded. This came from USPS. Thank you. I have had my pitcher only two weeks, and drinking the water every day, I cannot believe how much better I feel and how much better I sleep. Not sure why you got this pitcher if all you wanted was better tasting water. I always use bottled water anyway, wouldn't touch tap water. Chlorine in a gas kills people, but everyone seems to think diluted amounts in liquid form are an acceptable risk. Anyway, if you have health issues, keep drinking, and see the results. Depending on how severe your health problems are, it might take a while to overcome. I've had to study alternative medicine for 20 years, but I finally came out of chronic fatigue! Allopathic medicine gave me nothing. The body can heal if we give it the right ingredients, and Hydrogen is an essential one. I purchased the product along with extra filters and the same water tester as shown on product video. The tester showed water was not in the range where it showed on the video. I took a sample the same day to a professional lab and had it tested. Results were identical to my tester. I called TuraPur and reported findings. They apologized and gave a full refund when I returned the unused filter pack. They said not to return the pitcher. I’m stuck with an $80 water tester I have no use for. Hi Donny M, I love this product. Any chance you would like to sell me your pitcher? If yes, just let me know. Thanks! I just sent my third request for information in the past 2 months and I have never received an answer to my requests. I am very concerned, if I bought the pitcher and had a problem, that I would have trouble getting it resolved. I am not sure I want to do business with a company with such poor customer service. I tried it and I was really looking forward to the changes they touted - both because I was willing to try almost anything for better health and because sometimes our water tastes like chlorine. After a solid six weeks, I gave up. Not only had I not noted any physical improvement whatsoever, but because sometimes our water still tasted like chlorine. I was excited to receive my countertop pitcher and filter a little over a month ago. I put it to use immediately. After using it for one week I felt no different - water tastes the same as it did before filtering it through the pitcher. I would not purchase this product again and frankly think it's a scam. Not being able to return the pitcher is also annoying. A few companies refuse returns if a customer is not happy. Bottom line - don't buy it! I felt no noticeable difference after using the pitcher. I agree with chemists mg only releases hydrogen when in contact with steam, not tap water! The infrared given off by certain minerals in that small amount in a filter is negligible at best. Hey, put a quartz crystal in the sun and then in your water, send me $50.00 for instructions (joke)! It was late, I was tired and fell for the sales hype! I have a change of heart to this item TuraPur Pitcher, because for some reason, I think is finally doing something good, as I have decided to continue using it. For the past few weeks, I've finally started to feel good/a whole lot better in health - today than a few weeks ago. Slowly, but I think it is doing something good to me. I like/wish to know how could I go about purchasing one or two more filters to continue using it and see if this pitcher is the one improving my health issues! 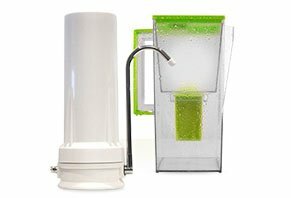 I order the TuraPur Pitcher about three months ago, and like to know if it's too later to return it for a full or any refund at all? Sorry, but I don't think it has done any different in my health for these past months I've been using it. I started using the TuraPur a year ago. In the beginning I had problems with getting the cover on right, I then marked the cover so I would know how to line it up. Once I did that no more cover problems. Drinking the water has become a way of life for me and I have felt better about myself and my feeling of being more healthy. I didn't plan it, but I stopped mixing fruit juices with my water, and I stopped putting Apple Cider Vinegar in my water, I just drink it plain without any additives. I have become just satisfied with the TuraPur water. I am 70 years old and my son who sees me once a year immediately noticed a difference and said I got out of the car with a spring in my step. I walk 3-4 miles effortlessly and enjoy near perfect health, my blood tests came back and everything was normal. For the couple of dollars for a TuraPur filtering pitcher, I say it's worth every penny, and I personally will not go without it. I easily drink 8-10 water bottles of it everyday. I now take the pitcher with me on trips so I won't go without my water. Oh, I was told I look and act like 50, who knows, but I feel good hearing that. This pitcher is crap. Then after sending an email saying NOT to send any filters and not to charge my account, they DID! I am reporting them to the FTC for fraud. Do NOT purchase anything from the company. The customer service is a joke, the reps leave you on hold for over 20 minutes and barely speak understandable English. Write a Review for TuraPur Pitcher!